This week, the Center for American Progress released a new report, “A Look at the Education Crisis: Tests, Standards, and the Future of of American Education.” In it, the researchers at CAP take a look at recent NAEP data to see if the state of public education is as bad as some say or on a rocketing upward trajectory as others say (guess it really depends on who your friends or online trolls are). USA Today’s Greg Toppo has a great summary of the report here. We’ve all seen that high school graduation rates are at all-time highs. But it is hard to celebrate such a statistic when we still see that only one in five low-income fourth graders achieved reading proficiency on NAEP. Or that only 52 percent of “nonpoor” fourth graders were able to hit that proficient mark. It doesn’t get better for eighth graders in reading. Only a third of them are proficient in cities like Charlotte, Austin, Miami, and San Diego. Boston comes it at only 28 percent proficient. NYC 27 percent. Chicago 24 percent. Philly 16 percent. Cleveland 11 percent. And Detroit at only 7 percent. So why do these eighth grade numbers matter so much? Most of the students in the eighth grade NAEP sample never attended school when Reading First was law of the land. Sure, they may have benefited from textbooks that were developed to meet RF requirements years prior. And some of their teachers may have utilized the PD and supports they received during the height of RF. But each of these kids has now gone through eight or so years of public school where scientifically based reading instruction was not demanded nor expected. These latest NAEP numbers, and the analysis from CAP make one thing very clear. We need scientifically based reading instruction in the classroom. Our teachers need to be prepared for it. Our elementary schools need to be based around it. Our students need to be instructed in it. And our families need to know it when they see it (and know when they aren’t seeing it in their community schools). Yes, Reading First had implementation issues. Yes, at times it was more steel hammer than velvet glove. But can we really say we shouldn’t be using what is known to be effective in teaching kids to read? Can we really say, with all the data that we have, that early reading instruction based on phonemic awareness, phonics, fluency, vocabulary, and comprehension isn’t the correct path? Can we really say a a philosophical approach to reading trumps and research-based instructional approach? And can we really say we should’t be using what is proven effective in the classroom? For those who condemn the Common Core’s emphasis on non-fiction texts, it is ridiculous to assume that a low-income eighth grader can read the rich literature sought when only a third of them are reading proficient in the first place. When scientifically based reading instruction became the law of the land in 2002, it was an approach that was embraced by all comers. The teachers unions. The principals groups. The superintendents. The teacher education community. The business community. All saw the value in using proven-effective approaches to instruction. All saw the need to do something to improve literacy, particularly with low-income learners. All embraced SBRR. We need to find that solidarity again. The most recent eighth grade NAEP scores show us that taking a different path has failed too many kids … again. We need to remember that literacy is not, or at least shouldn’t be, a political issue. Whether we want all kids to pass a high-stakes, state-based, standards-aligned exam or we want all children to find a love for learning and literature, the ability to read is a non-negotiable. While Reading First has now been relegated to the history books for the past decade, we cannot and should not ignore the hundreds of thousands of research studies that showed the effectiveness of scientifically based instruction. We cannot and should not ignore the reality that, when SBRR was in full effect in the early to mid 2000s, reading proficiency rates were on the rise, both with the low-income students the program targeted and other learners who benefited from the focus on SBRR-based instructional materials and PD. And we cannot and should not ignore that far too many kids — particularly those that are black, brown, or low-income — are struggling when it comes to reading … and we know just what should be done to help them. One of Eduflack’s favorite streams on Twitter these days is @ThanksCommonCore (also with #thankscommoncore hashtag). With each passing day, it seems more and more that leads to the potential downfall of western civilization is being blamed on Common Core. We, of course, know it isn’t actually Common Core’s fault. Those who actually take the time to read and understand what is in the standards realize Common Core that Common Core really isn’t to blame for all of the horrors in the world. And neither are the Common Core tests. A good assessment measures the progress of student learning. It isn’t something that is prepped or crammed for the evening before. But back to today’s story. Over the weekend, the edu-family decided to check out a summer camp fair at the local shopping mall. Being new to the area in New Jersey, we wanted to see what local day camps were available for the summer, hoping to avoid the “free-range children” approach we took to last summer. And much of what we saw was what we expected. Several nature camps. A number offering Minecraft and robotics. Camps run by the YMCA. Fabulously expensive day camps run by local private schools. Even summer camps run by our daughter’s gymnastics school. But I was sucked in by a banner from a local “learning center” trumpeting PARCC Preparation Camp. Yep, you read that right. We now have folks looking to turn a summer buck cashing in on parents’ fears about the dreaded Common Core test. We know PARCC is on everyone’s mind. We are actively working to make sure our students are prepared for whatever the test throws at them this March and May. If you’re not sure what you can do to help your child prepare, come speak with us. We can diagnose your child to see where there may be some areas of weakness and put together a game plan on how to fill those gaps in understanding. That’s right. For all those parents worried about the dreaded Common Core test, have we got a product to prey on you. 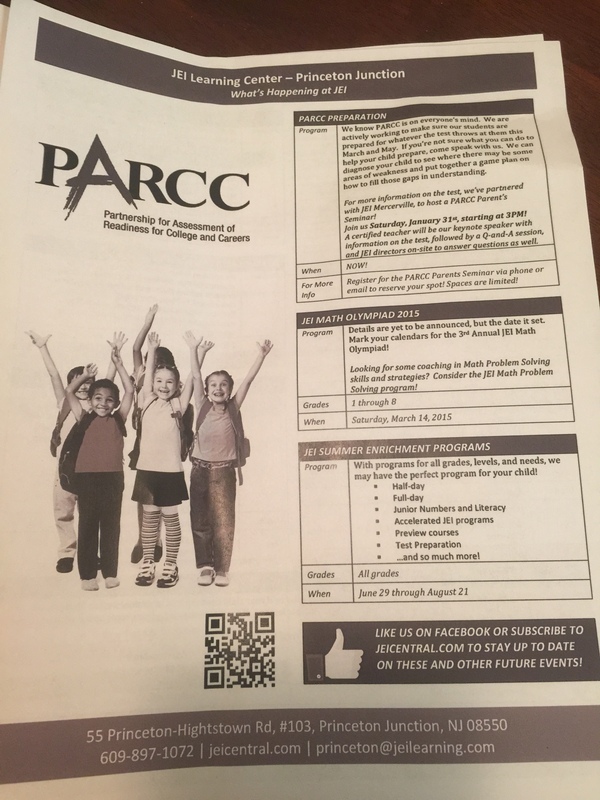 And we do it with the big logo and image that PARCC uses, so you think it is official. Worried the test will doom your kid to a life of flipping burgers? Have we got a program for you. Concerned the neighbor kids will do better than yours? Enroll today. Fear that some of the top public schools in the nation are falling down on the job? We are here to help. They also offer to supplement the Common Core Test Prep Camp with other programs to better your kids in English, math, literature, creative writing, and critical thinking. And they throw in essay writing to ensure your kids can get into college once they’ve mastered that dreaded Common Core test. Eduflack realizes that companies looking to profit on changes in education is nothing new. A decade ago, I spent far too much time dealing with new companies looking to cash in on the Reading First largesse. It seemed everyone had a new product “aligned” with scientifically based reading, and was more than happy to take money from the state, a school district, or a parent to ensure that all kids were reading. Unfortunately, too many of them were smoke and mirrors, magical elixirs and silver bullets that had no basis in what works and just wanted to score a quick buck while the going was good. And now we see that in Common Core. Everything from Common Core-aligned (and Star Wars-themed) workbooks for parents to purchase to now CCSS test prep camps. It’s just shameful how often we look to take advantage of the legitimate concerns of parents and teachers to make a quick score and pick up a few more bucks in the process. My kids won’t be going to Common Core camp this summer. There is likely Minecraft and gymnastics camps in our future. Our son (a third grader) also wants to go to one that will help teach him to make his own Lego movie. But he won’t be cramming on things that most likely aren’t even found in the Common Core State Standards. And they may even go to one of those nature camps. Should they get sunburn, I’m just going to blame Common Core. As some may know, in 2005 Eduflack was part of a team that was asked to put together a book to help parents and teachers better understand scientifically based reading instruction. This came out of my work with the National Reading Panel, which looked at decades worth of research to determine the best ways to teach young children (those in kindergarten through third grade) how to read and how to read at grade level. A lot has changed since 2005, both in education in general and with regard to literacy and reading instruction specifically. But the guidance SBRR provides hasn’t changed. We still know what works. We still know what is most effective for teaching kids – particularly those from historically disadvantaged backgrounds – to read. We still know if a child isn’t reading at grade level by the end of third grade, learning in the later grades just becomes harder and harder. But since Why Kids Can’t Read originally came out, we’ve had knock-down, drag-out fights on everything from Race to the Top to teacher evaluations to new ELA standards under the Common Core. While these debates have garnered all the headlines, they haven’t diminished the importance of doing what works when it comes to teaching literacy skills. And they certainly haven’t reduced the importance of parents in the teaching and learning process. That’s why I am so excited to announce that Why Kids Can’t Read: Continuing to Challenge the Status Quo in Education, from Rowman & LIttlefield, is now available to help teachers and parents navigate this important subject matter. Done in collaboration with my co-editors Reid Lyon and Phyllis Blaunstein, Why Kids Can’t Read offers personal stories from parents and educators on how they have “beaten the odds” when it comes to teaching kids to read. It also provides a deep understanding of what the research says AND how parents and teachers can use the research to ensure each and every classroom is doing what works when it comes to literacy instruction. Contributing authors include Teresa Ankney, Diane Lyon, Phyllis Blaunstein, Norma Garza, Marion Joseph, Richard Long, Reid Lyon, Sara Porter, Benjamin Sayeski, Bennett Shaywitz, Sally Shaywitz, and yours truly. It also offers a foreword from Carol Hampton Rasco, the president and CEO of Reading Is Fundamental, and a preface from former U.S. Education Secretary Richard Riley. For those parents with struggling readers at home, it is worth a look. For those seeking a refresher on SBRR, it is work a read. And for those looking for inspiration from parents and educators who are doing extraordinary things, it won’t disappoint. Of course, I’m biased. As the lead editor, a contributing author, and the father of a struggling reader, this book is quite personal to me. But it should be personal to all of us. We should want every kid reading. We should demand every fourth grade reading at grade level. And we should never make excuses for so many children – particularly kids of color – struggling with reading. Couldn’t say it any better myself. My deepest apologies to Eduflack readers for not being active here in the past few weeks. As I noted last year, dear ol’ Eduflack has been involved in some long-form content creation (meaning book writing). It took up many months of my time last year (thus the hiatus) and has come back to require my attention over the past few weeks. The great news is I’ll be able to announce the completion of a very personal and I think important book next week. As one reviewer already put it, the book “ROCKS!” So February is going to be a rockin’ good month, with this new book from Yacker Media. I look forward to sharing the news with y’all next week or so, and will work to share free Kindle copies of the book with loyal Eduflack readers as soon as allowable. 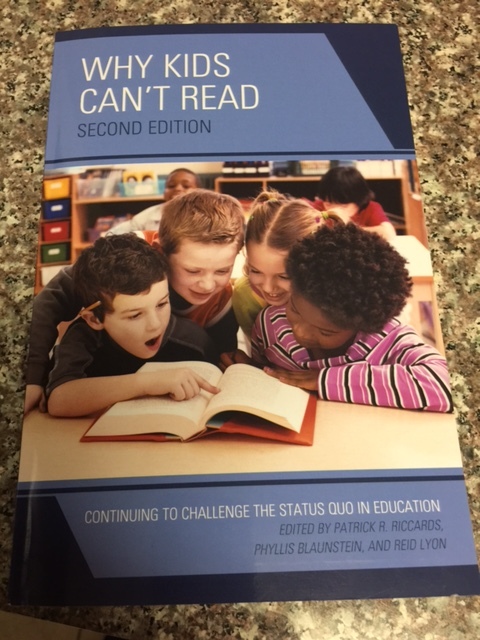 I’m also in the process of wrapping up the second edition of the Why Kids Can’t Read: Challenging the Status Quo in education book that Rowman & Littlefield Education will be publishing later this year. Back in 2005-06, I was a contributing author to the project. For this edition, I am the lead editor, working in partnership with longtime colleagues and mentors Reid Lyon and Phyllis Blaunstein. Why Kids Can’t Read is an important story, particularly as we see that nearly 40 percent of the world’s school-age children are unable to read proficiently. The first edition of the book, out in 2006, looked at the wealth of research we have on literacy instruction and how best to teach our kids to read, while offering practical guidance for parents for how to ensure that “what works” is what is being used in their child’s classrooms. The second edition builds on that work, incorporating recent developments such as Race to the Top and Common Core State Standards into this important discussion. So thanks for your patience. Eduflack will be back to its regular schedule in the coming weeks. Happy reading (post-announcement, I hope! ).